Global stocks were mixed Wednesday as investors adopted a cautious stance before the U.S. Federal Reserve policy decision and awaited further news on U.S.-China trade talks, where negotiators remain at odds. Ten-year U.S. Treasury yields slipped. Miners and carmakers led a decline in the Stoxx Europe 600 Index, as BMW warned earnings would fall. German chemical maker Bayer headed for the biggest drop in 15 years after losing a round in a U.S. jury trial over claims its Roundup weed killer causes cancer. Futures on the S&P 500, Dow and Nasdaq edged up. Bank UBS said conditions in the first three months have been among the toughest in years. 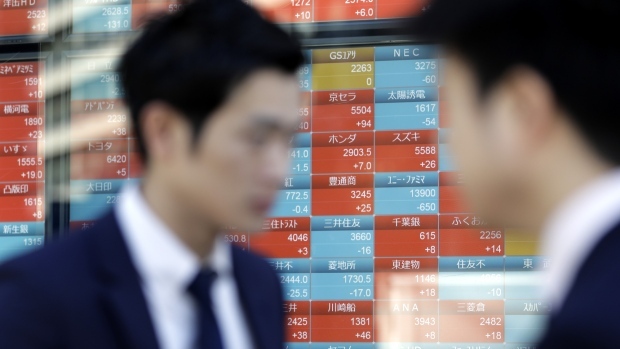 In Asia, Japan finished higher, while most other markets dipped. Two-year Treasury yields remained below the top of the Fed’s policy target range amid expectations of a dovish tone from the central bank, while the dollar ticked higher after three days of losses. The pound fell as U.K. Prime Minister Theresa May prepared a request for more time to reach a Brexit deal that could win support in the nation’s Parliament. The euro held steady after German producer inflation data missed estimates. European sovereign bonds were mixed. Stock and bond markets fell into a lull as traders prepared for the Federal Reserve’s policy statement and so-called dot plot projections of interest rates. Apart from a hold on rate increases, markets will watch for word on plans for ending the Fed’s current bond-portfolio run-down. Meanwhile, Britain’s attempt to leave the European Union lumbered on in the background, with just nine days to go and no deal or extension agreement in place. Elsewhere, emerging-market currencies and shares were steady. Iron ore fell after a Brazilian court ruled that Vale should be allowed to restart a major mine. Company earnings this week include Tencent, Hermes, Tiffany, Micron, Nike and PetroChina. On Wednesday, the Fed is expected to hold interest rates steady, announce plans for the end of asset roll-off from its balance sheet, and lower projections for the number of interest-rate hikes this year. Central banks in the U.K., Thailand, the Philippines and Indonesia are all scheduled for policy meetings. Euro-zone purchasing manager survey numbers on Friday will give an indication of the health of the region’s industrial and service sectors. The Stoxx Europe 600 Index fell 0.3 per cent as of 9:29 a.m. London time (5:29 a.m. ET), the first retreat in more than a week. Futures on the S&P 500 Index increased 0.1 per cent. The MSCI Asia Pacific Index decreased 0.1 per cent. The MSCI Emerging Market Index declined 0.1 per cent. The Bloomberg Dollar Spot Index advanced 0.1 per cent. The euro declined less than 0.05 per cent to US$1.1347. The Japanese yen sank 0.2 per cent to 111.57 per U.S. dollar. The MSCI Emerging Markets Currency Index increased less than 0.05 per cent to the highest in three weeks. The Australian dollar climbed less than 0.05 per cent to 0.709 per U.S. dollar. The yield on 10-year Treasuries fell two basis points to 2.59 per cent. Germany’s 10-year yield fell less than one basis point to 0.09 per cent, the largest fall in more than a week. Britain’s 10-year yield dipped one basis point to 1.176 per cent, the lowest in more than a week. The spread of Italy’s 10-year bonds over Germany’s rose two basis points to 2.4137 percentage points. The Bloomberg Commodity Index fell 0.1 per cent. Brent crude decreased less than 0.05 per cent to US$67.59 a barrel. LME copper dipped 0.1 per cent to US$6,452.00 per metric ton. Gold fell 0.3 per cent to US$1,302.38 an ounce.